Coping with the loss of a child in a terrorist attack is one of the loneliest experiences a parent can face. For Ari and Ruth Schwartz, who lost their son Ezra in a terror shooting in November, the isolation is intensified because the family lives in America, far away from the support of other bereaved parents. 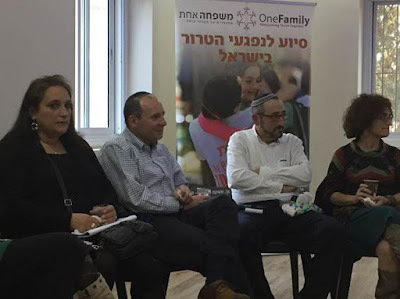 That’s why OneFamily Fund, which provides support to victims of terror, sponsored the family on a visit to Israel and arranged for them to meet with other parents who have lost children to terror. Ari and Ruth participated in a support session with members of bereaved families. Ruth shared her memories of Ezra, noting that “everything was more fun when Ezra was around. His personality was so big.” Ari asked the parents questions that could only be directed to others who have shared the experience. The group included BatGalim Shaer, the mother of Gil-Ad Shaer, one of three teens who were kidnapped and murdered last summer. The kidnapping took place in the same location as the shooting that took Ezra’s life. During Ezra’s shiva, OneFamily paid to fly BatGalim and her daughter to America to provide personal support. Others included Nachum and Brenda Lemkus, whose daughter Dalia was stabbed to death in 2014 in the same location where Ezra Schwartz was killed and the three teens had been kidnapped and murdered; Tirza Levy, mother of Rabbi Nechemia Lavi, killed in the Old City of Jerusalem in October when he came to the aid of other terror victims; Ronit and Ury Cherki, whose son Shalom was killed in car ramming at a bus stop in April; Cheryl Mandel, whose son Daniel was killed in combat at 2003. The meeting also brought together Rivkah Moriah, whose son Avraham David Moses, killed in the terror attack on the Mercaz HaRav yeshiva in 2008; Pirhia and Yossi Apter, who lost their son Noam in a terrorist attack on a yeshiva in Otniel in 2002; and Penina and Simcha Malik, whose son Gedalia was killed fighting in Jenin. Sarah Rosenfeld, whose son Malachi was killed in a drive-by shooting on his way home from a basketball game in July, started the session by telling Ari and Ruth that the purpose of the evening was to give them a big hug and “a gift from our own lives.” And the evening ended with hugs all around. The parents greeted Ari and Ruth with love and support, shared their own bereavement stories, and spoke about their journey of grieving and recovery. Most importantly, they let Ari and Ruth know they are not alone. Brenda Lemkus warned against the feeling that bereaved parents need to project an image of strength. “You don’t need to be strong for anyone,” she said. “You only need to be strong for yourself. Nachum Lemkus urged the family to carry on with projects that their son would have wanted them to do. “Do it in his name, no matter what it is.” Ari agreed, noting that the original purpose of the visit was to help fix up the park in Gush Etzion, as Ezra was doing at the time of his death. Ronit Cherki urged the couple to respect their own feelings. “Trust yourself about what you need,” she advised. Simcha Malik told the couple that part of their journey would be to progress past the point where other people feel they need to give to them. “It’s the other way around,” he said. OneFamily provides financial assistance, therapeutic programs, legal assistance and a steady stream of personal encouragement for each victim and their family. The organization’s presence and resources ensure that victims and their families never need to feel alone. As some of you might recall, Ezra HY"D (May God Avenge his blood) graduated from my alma mater, Maimonides School in Brookline, Mass. The defending Super Bowl Champion New England Patriots held a moment of silence for Ezra during the shiva week. Ezra was a huge Patriots fan. The story above was provided by OneFamily. I have mentioned OneFamily on this blog several times in the past. The organization was started by friends of Mrs. Carl and me.